Let’s go back two weeks from today, shall we? And so HP, after sales continued to nose dive, threw in the towel on the tablet front and literally overnight, killed the WebOS strategy. So now HP has these warehouses full of TouchPads and they’re freaking out over what in the world to do with all of them. Dropping the price made sense, so they came out and dropped the price in order to start clearing them out of inventory. But things were necessarily clearing out as quickly as HP would like, so they decided to drop the price even more to $99 for the 16GB model and $149 for the 32GB model. And then guess what happened…??? It was as if Apple just released a brand new iPad. Lines formed around city blocks. The HP TouchPad was selling out of stock in less than 5 minutes in WalMart. 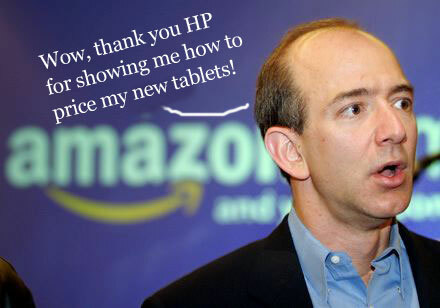 Chaos was unfolding because now, all of sudden, everyone wanted the HP TouchPad. But wait a minute. Isn’t this the same TouchPad that a few weeks ago was selling so bad that HP decided to kill the program altogether? So what, all of a sudden, put the demand for the HP TouchPad on the same level – or even a higher level from a demand standpoint – than the iPad? One simple word answers the questions: price. The TouchPad drops to $99 and now, suddenly, the stores can’t stock the tablet fast enough. Mark my words. When the Amazon Android tablet finally does hit the market, I guarantee the price will be substantially lower than any other tablet on the market. And I would almost guarantee we’ll see a 10.1 inch Amazon tablet. Amazon is all about selling a ridiculous amount of product, especially product they invented, like the Kindle which is now the #1 best selling item on Amazon of all time. So when Amazon’s next invention comes out, the Amazon Android tablet, you watch how they price it. It’s going to be priced to not only sell like crazy, but it’s going to be priced to capture the attention of all the media outlets worldwide because of the madness surrounding the sales volume.